At CaliforniaSportsCards.com, we're collectors, too. 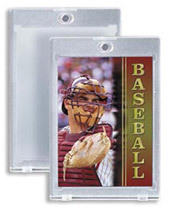 So we know how critical it that you be able to store and display your valued cards and mementos to accentuate their value. That's why we offer a complete assortment of storage and display accessories to help you make sure your collection is always looking good, now and forever.